Keeping British Seagull Outboard Motors Running! 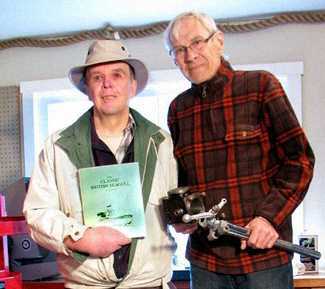 The Maritime Centre's outboard motor expert Tony Owen (right) with "Classic British Seagull" author Don Meyer (left) at the Maritime Centre last week. Tony Owen, the Cow Bay expert on British Seagull outboard motors, had a visit from fellow expert and author Don Meyer last week. Tony loves the Seagull’s simplicity and rugged reliability, and considers them the ultimate in “recycling”. The Centre has a good supply of parts to keep these old motors running indefinately, so if you have one that needs a little TLC then talk to Tony!